The newly introduced Ebac CD200 Dehumidifier is a medium capacity commercial unit. Is this one of the best dehumidifier models for businesses? The Ebac CD200 is a powerful dehumidifier yet surprisingly compact. It is strongly built which accounts for its weight of 176 pounds and this unit is clearly better suited for permanent installation than frequent movement on site or between distant locations. The power of this dehumidifier has one down side which is the noise level. On the higher of its two fan speed settings this unit generates 73dB, enough to be intrusive in many locations. The two fan speeds are an advantage but they cannot be selected while the dehumidifier is in operation. The choice must be made at the time of installation by removing the filter cover, followed by the electrical box cover, and connecting a link wire between one of two sets of terminals. The default fan setting is high speed. The Ebac CD200 Dehumidifier is ductable and optional duct flanges may be purchased with the dehumidifier if a ducted installation is more suited to your needs. The unit is wired for a remote humidistat (also available for purchase at an additional charge) so the unit may be installed outside the drying area, reducing the impact of noise. The Ebac CD200 Dehumidifier is offered at a fairly high price, approaching $4000. The unit is not exceptionally energy efficient when compared with other dehumidifiers in its class. The CD200 is very strongly built and should prove durable, even in very harsh environments. Its "reverse cycle" defrost system provides an effective low temperature operating capability, down to 33°F/1°C. The Ebac CD200 is a medium to high capacity dehumidifier aimed at commercial and industrial users in a wide variety of environments. Robust construction and low temperature operating capability make this unit suitable for harsh environments including marine vessels and oil rigs. The high extraction capacity is sufficient for large areas of up to 21000 cubic feet and this power, combined with the CD200's compact dimensions, may appeal to operators of manufacturing plants, storage facilities and large public areas. Among the suggested applications included in the Ebac product brochure are basements. I shall comment on this in the next section. The Ebac CD200 is a recent arrival in the market and no user experience is presently available. In my view this dehumidifier is best suited to the more demanding industrial applications, such as on an oil rig, where its tough construction and well protected steel casing may be essential. Its operating temperature range will also be an advantage in this and similar environments. Where its capabilities are essential the CD200 may justify its price but in less extreme conditions there are cheaper alternatives which will be equally effective. In public areas, when the general noise level is low, the 73dB generated by this unit may be unwelcome. 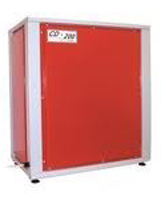 If the particular qualities of the CD200 suit your needs for a public area of your business a remote, ducted installation may be required. With regard to basements; the Ebac CD200 Dehumidifier may be considered for the basements of business premises but may not be the most cost effective solution. For most householders the cost of this unit will be prohibitive and even those who can afford it can find less expensive solutions that will work as well, even if their basements are very cold at certain times.